She was a proud buxom lady who commanded a very special aura of respect whenever she entered the oversized kitchen. It was the kind of respect you knew never to mess with because behind her kind smiles and her liberal patience there was her haughty dignity of being one of the best in her field. Anyone who dared to disregard this fact by challenging her significance, would become the subject of being abundantly praised out of her kitchen and into one of her inferior colleagues’ less meaningful sculleries. Before they even realized the poor exchange they had made, it was far too late to make any amends and many a wretched trainee ended up biting in the sour apple. My plan was to stay here for a month, maybe two and then rapidly switch to the Front Office department I was itching to be a part of. For my 21-year old self that was where the real action was. Here, in the kitchen of this expansive business hotel in Freiburg I was missing out on the happenings of the outside world. Germany was not on my plan but it offered the best and intelligible training plan compared to the other hotels I had applied to. I had sketched out a maximum stay of 6 months in Germany, learn the required and hurry back out to continue with my studies. Strudel was also not a part of my plan. But here I was, standing in the basement kitchen, sleeves rolled up, hands covered in flour listening to her talk about strudel. My ears were not yet accustomed to the heavy German accents I was encountered with everyday so it was often a tedious task to stay focused on the subject of the day. I fancied myself living simply and loftily, spending my days talking to guests in French, English and broken German, organizing their trips to the vineyards, theatre or musicals, in the evenings, I imagined myself writing essays in one of the charming German Marktplatz or drinking exquisite wines in the cobbled backstreets enjoying the warming sun beams on my face. Today, I was in this windowless, dank training kitchen situated in the basement of the hotel with shafts of cold tungsten light illuminating the room. Today I would learn how to make strudel from scratch - the true Viennese strudel as she emphasized several times. While my fellow trainees seemed eternally enthusiastic about this fact and eagerly collected utensils and weighed the items, I believe I lacked the luster and failed to see the advantages learning how to make strudel would have on my future hotel career. I wanted to learn the basics of Food & Beverage not actually get in so deep to actually be a part of it. She made her rounds, checking to see each students progress. Wordlessly she circled the workstations giving either a nod of approval or arch the eyebrow to show her disapproval. I was having trouble with my dough, it was far too sticky and I was not looking forward to the raised eyebrow of disapproval. So I did what I never do - I gave up. I literally threw in my towel and marched out of the kitchen. It was only when the fresh oxygen surged into my head, I actually realized the magnitude of what I had done. As I walked back into the kitchen she was wiping down the metal surfaces. She always meticulously re-cleaned her kitchen after the students left seeing spots and stains where others failed to do so. My workstation gleamed under the fluorescent tube and I was plagued by my conscious. Without words she handed me a cleaning rag and I began rubbing the spotless surface. I felt like Daniel in Karate Kid under Mr. Miyagi’s watchful eyes. “Wax on, wax off” and waited for a higher meaning to enlighten me. “You do not need to learn how to make strudel dough here, you can buy it from any shop, but you have missed the chance on adding more leidenschaft to your layers! You have biß and when you are ready you will make strudel.” She smiled her knowing smile, nodded the head and with the dignity of a queen walked out of the basement kitchen. Several years later I did make my own strudel from scratch learning from my mother-in-law. I was ready for the new layers in my life! Now, after more years have passed I’d like to think of myself as wiser with my age ... I do not need to spend hours in the kitchen making strudel dough. I’d rather cheat and buy it at the store and spend that cheated time with my girlfriends, family or friends indulging in the flaky dessert. The prolonged winter we are having this year is skimping on the produce offerings and the stores are not as abundantly stocked as they usually are at this time of year. I’ve been waiting for rhubarb to come into the stores for a long time. 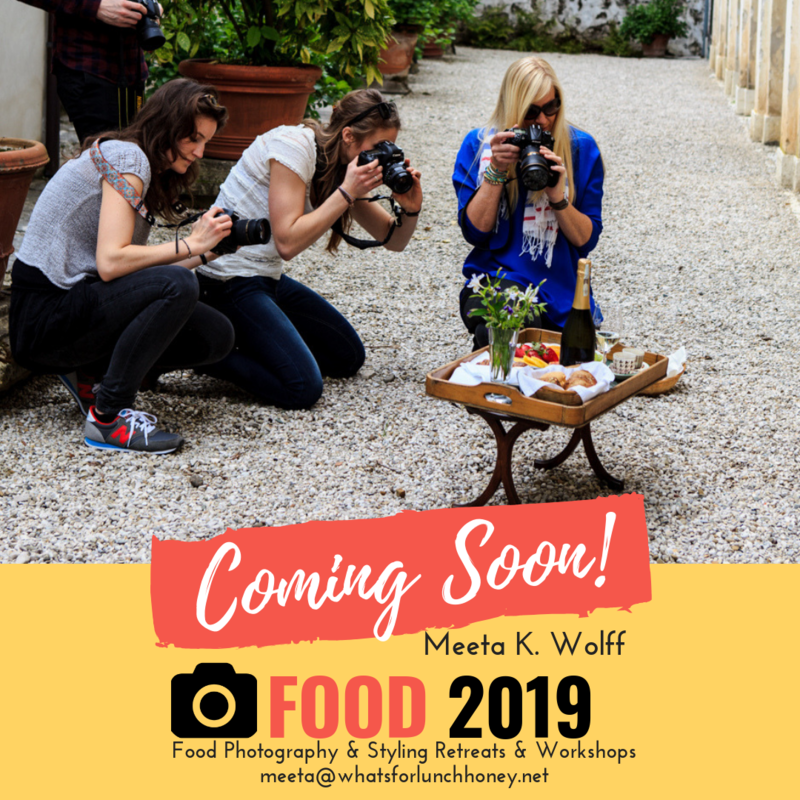 First for a photo session in February - yes I know that was illusionary - and then to get into the kitchen and experiment with new recipes. Finally rhubarb did arrive and with a few of the first specimens in my bag I headed home to make strudel. I stopped at the bakers on the way home and bought a few sheets of strudel dough with all the leidenschaft needed to make a grand rhubarb strudel. The filling is a smooth tangy quark filling spiked with ginger and lemon and gently roasted rhubarb not too sweet but definitely with a lot of depth. 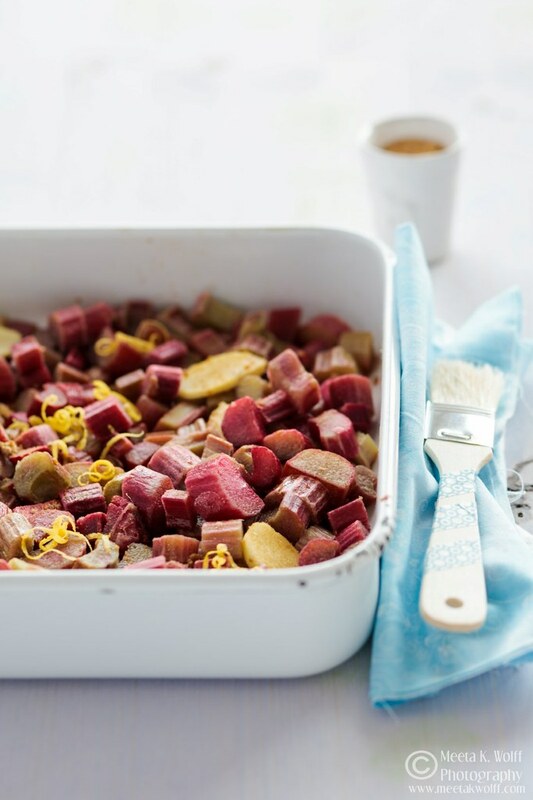 Begin with making the rhubarb for the filling by placing it in an ovenproof dish and sprinkle with 50g muscovado sugar, 1/2 of the lemon zest and ginger, toss well then roast in the oven for 10-15 minutes. Remove and strain through a sieve reserving the juices. Lay out 4 sheets of the strudel dough on a lightly floured surface. 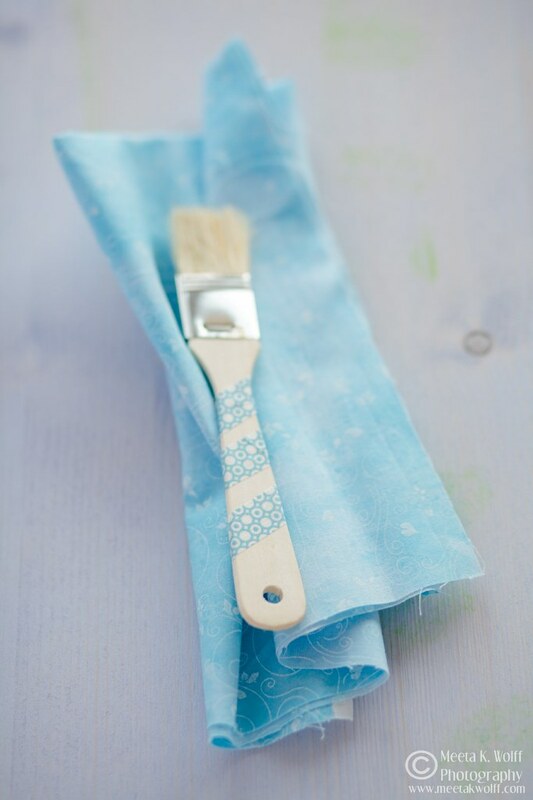 Use the 80g melted butter to brush the sheets, then lay another 4 sheets, brush again with butter and layer the final 4 sheets. For the quark filling, beat the egg whites to stiff peaks. 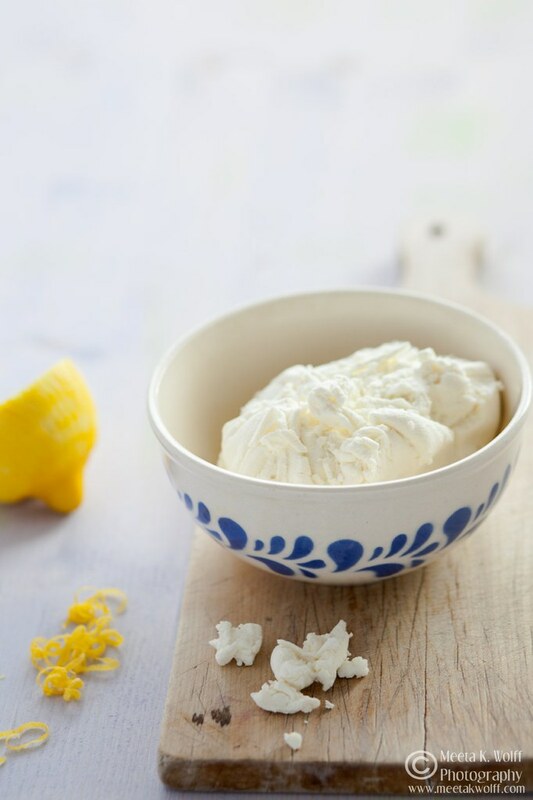 In a separate bowl whisk together the quark, egg yolks, 75g sugar, 60g butter, the remaining lemon zest and cornflour until ingredients are smooth and nicely incorporated. Using a spatula, fold in the egg whites. Spread the filling on the strudel dough leaving approx. 2-3 cm free around the edges. Place the ginger-lemon-rhubarb slices over the quark filling and then roll the strudel from the long side. Tuck in the sides and brush with the egg white to seal. Transfer the strudel to a baking tray lined with baking paper and brush with the remaining melted butter. Bake the strudel for 25- 30 minutes until golden. Remove from the oven allow to cool and dust generously with icing sugar. Note: The strudel tastes best when it is still slightly warm and served on the same day. This tastes awesome with some thick vanilla sauce or vanilla ice cream. If you do have leftovers, heat the slices gently in the microwave. Make you own homemade quark using my recipe. No I do not have a nagging voice at the back of my head. I do buy strudel dough from the stores or my bakery. Maybe because I have learnt my lesson in dough making and know that a lovely flaky dough made from scratch will always add layers of experience to your repertoire and I really encourage everyone to take the time to master the art of strudel dough making at home. It’s an experience of many advantages. But if you are looking for a fancy yet quick treat to enjoy with the family or friends grab the packet from the stores. Nowadays, there are super quality strudel dough available. In Germany you can even buy it at some bakeries - you baker is your best friend for such requests. 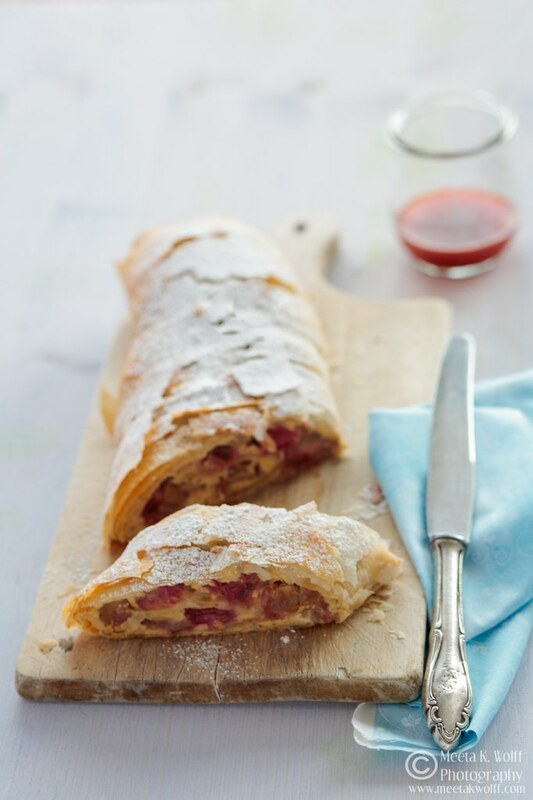 The filling for this strudel is very custard-like using tangy quark as a basis. It complements the rhubarb flavors brilliantly. 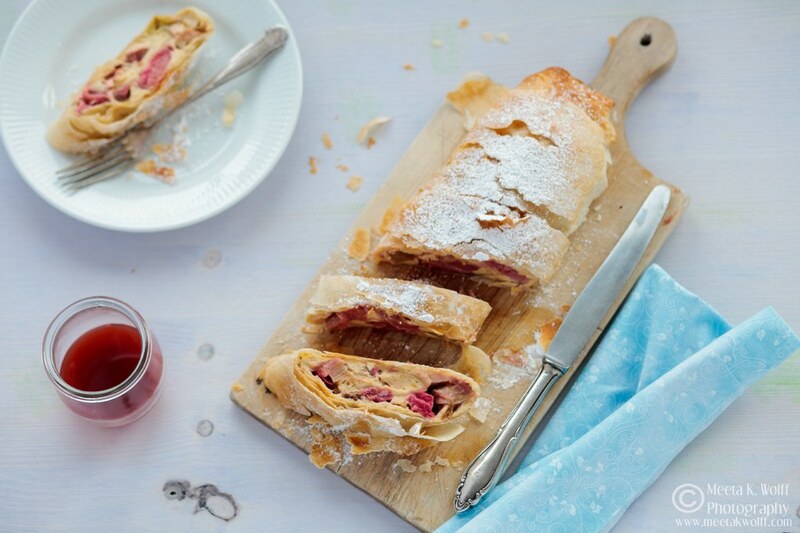 A fantastic strudel and irresistible treat! Wonderfully spring-like and spicy. Thanks Rosa! It was great! One always needs a good story with a strudel. Glad you enjoyed it. And i am glad I decided to stay too! This was a wonderful tale Meeta that we can all relate to. My mom was not a good cook and yet she could master strudel dough with precision, something she taught herself in her own kitchen. I have never attempted it myself but like puff pastry maybe someday I will get the call. Until then you'll be fine making strudel with store bought dough! Thanks! Your rhubarb treat is pretty good too. It has inspired me! Your post really captured me. What a great story full of personal life. I'm a strudel lover. I try to do the strudel dough making at home when possible, otherwise I cheat. While on rhubarb I have to learn at lot...first of all where to find it a reasonable price here in Rome. Is it expensive in Rome? Have you ever tried frozen rhubarb. I hope you find some and make this with your homemade strudel dough! 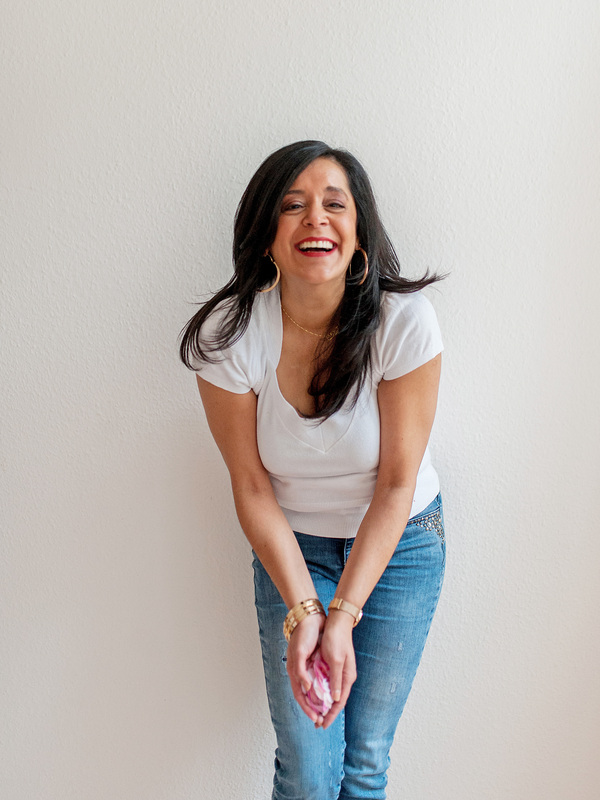 I can almost picture 21 year old you in that kitchen Meeta! That strudel looks totally delicious and I'm pretty sure it tastes every bit as good as homemade strudel dough. I actually tried that once too but once was enough for me! Lol... Wish I was there to have a slice with you! Wish you were here too. But we shall be soon and that makes me happy. We won't have much time for strudel ... but we do have stroop waffles on the menu! What a BEAUTIFUL post Meeta, I loved reading it and I could almost picture the basement kitchen. I never had strudel, nope never. I don't even know how the dough looks like, but the crust in the photo looks so tempting. I have to look for strudel now. Thank you so much! You should make this a huge to do Kankana ... you have to try strudel and really the best place to do so is Germany or of course Austria :o) The crust can be compared to phyllo dough. 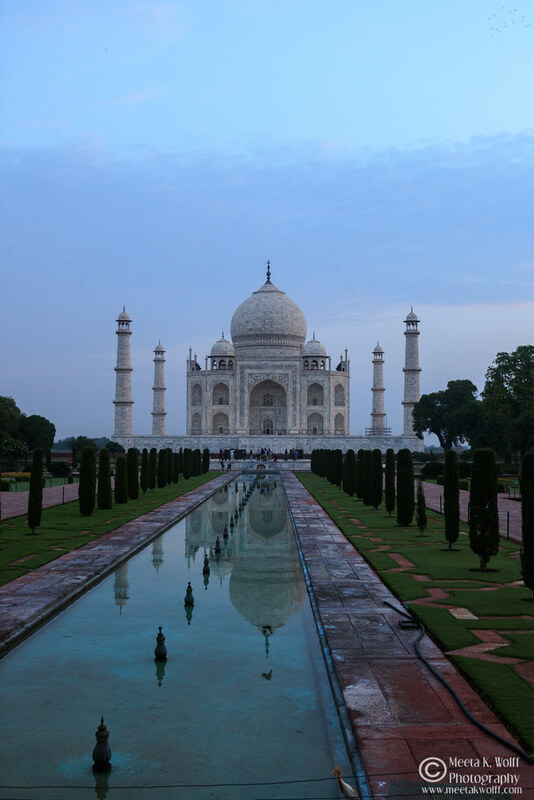 Beautifully written and the pictures are just incredible!! I just love that you've added ginger to the filling! Thank you so much Antonia! I love ginger and often make a Rhubarb Ginger crumble. They pair really well with each other! I've been waiting long enough for it to arrive :o) Glad you enojed the post and the recipe! The strudel looks fantastic ! I agree, store-bought strudel dough has plenty of Leidenschaft... :) I spent a year doing a study abroad in Freiburg and you just totally took me back. Love it! Thanks for the great story and the wonderful recipe! Oh wow! Really? I am glad I could take you back. I loved Freiburg - an amazing and beautiful city. Glad you enjoyed it! You are such a superb story teller, Meeta! And I can just picture your buxom lady chef in Freiburg, no nonsense people here in southern Germany. I love roasted rhubarb and the ginger is just perfect. HAHA! Yes Barbara .. no nonsense she really was! Hope you make this! Sounds like a very wise woman, there are quite a few pesky layers before we get the to the good part of most things in life aren't there? Yes there are many layers ... but I'd like to think that unfolding the layers always brings interesting surprises and experience with it. I understand proper strudel dough is difficult to make. Honestly, I don't think I've ever tried the real thing. 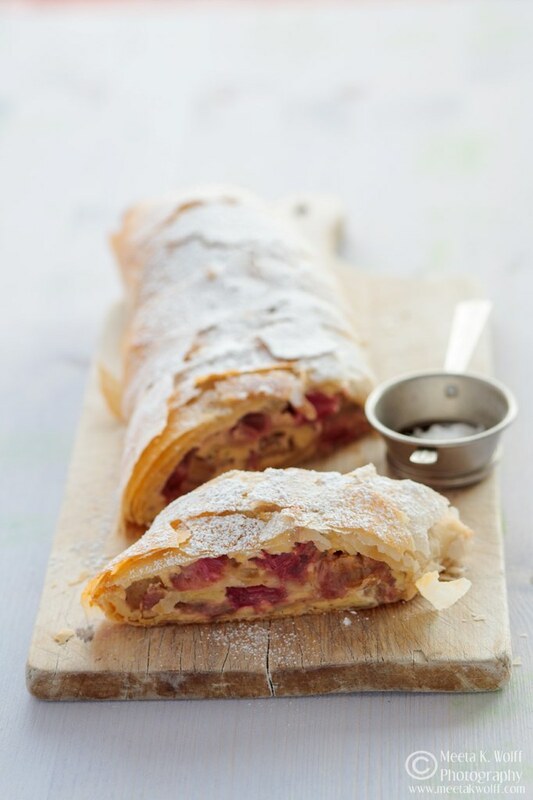 We have nothing that comes close in the US and I think it would be a challenge to find a strudel master like yours. 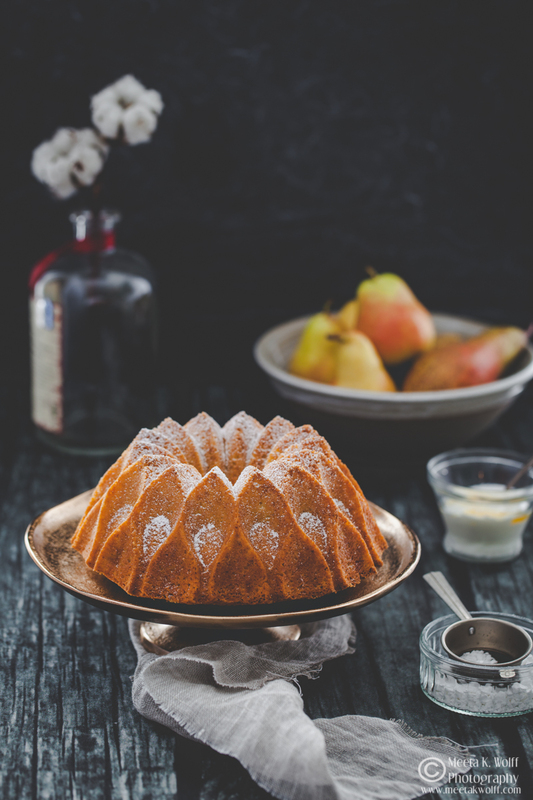 You're lucky to be around such incredible dessert makers. I must say, yours looks amazing! 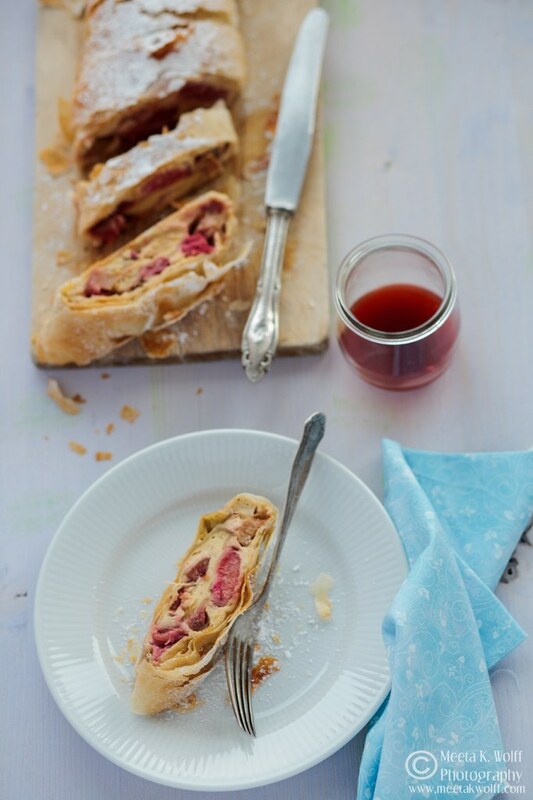 Love both the story (inspiring words from a wise lady) and the look of this stunning strudel. It's as if I can almost hear the crispy layers when I put a fork into them, smell the ginger and taste the sweet rhubarb. Lovely Meeta! Lovely pictures!! I have never tried anything with rhubarb.Cant wait to try this. And I'm so coming over when you're doing the workshop in Amsterdam to give you a big hug, finally! Love your story and the look of the strudel. Delicious. what a lovely story and I would say I was in a similar situation when I went to enginnering school, while my heart was in hotel management ...Lol! Have never tasted a strudel before and you bet I'm tempted right now! I want that strudel right now ! this is fantastic! i just found this through the fox in the pine blog and was completely taken by the idea of combining ginger with rhubarb. i must get me some rhubarb soon!! My mother baked the most beautiful strudel, often with farm cheese. Your post brought back some good memories for me. Thank you. 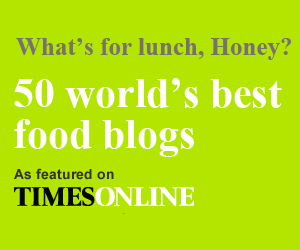 Your recipe looks amazing and I love rhubarb & ginger - its my favorite jam combination. However, I have NEVER heard of quark! What is it, where do I purchase it and what do I do with it?? Any thoughts?